Being raised by a woman from Boston, my Thanksgivings never saw cornbread stuffing. Only herb stuffing. I still make it to this day. Usually my Southern friends look at it with wonderment because they’ve never seen anything like that before. Thanks, Stouffer’s, for keeping it on the shelf for me. Normally I add celery, onion, water chestnuts, a little sage, chicken broth and half the butter that the recipe calls for. I don’t stuff my bird any longer, except for the neck end so it looks pretty. I like to bake my stuffing with the drippings on the top so it gets nice and crunchy. 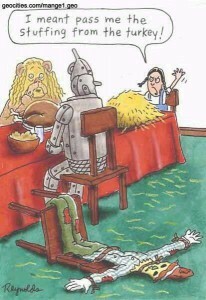 I’m pretty sure the stuffing is what makes us all, well, so stuffed after eating Thanksgiving dinner. Enjoy yours, whatever kind you make.